The Last Steamer and Other Strange Tales by Bob Mann has recently been published by Longmarsh Press of Totnes. The author is a well-known figure in Arthur Machen circles and a writer on South Devon history, folklore and mysteries, and this new book collects some of his fine supernatural stories, originally shared with family and friends at Christmas. 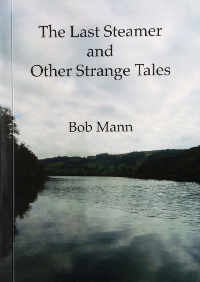 Bob Mann understands that some of the best ghost stories are rooted in a strong sense of place, and his succinct but vivid tales set in the mysterious byways of a certain corner of Devon gain from his deep knowledge of local history and legend. He also knows that the strangest experiences can be those that don’t quite cohere: they result from hazy glimpses, passing encounters, things we are not quite sure we saw, and he is adept at suggesting just enough, and no more. So here are compelling accounts of an “ancient and terrible” steam boat that simply shouldn’t be there, a horned ceremony in a churchyard at night, the alluring modern manifestations of femmes fatales at a haunted castle, a citadel that hasn’t existed for centuries, the figure of a redoubtable teacher in an organ loft, and even – what a wonderful idea! - a phantom brass band. Arthur Machen enthusiasts will also delight in finding sly allusions to the Gwent master and his work. With each of these highly relishable yarns we feel a strong sense of the past still resonating in our time, while also enjoying the author’s wry sense of humour and light touch. There's no button for ordering the book and Amazon UK doesn't stock it. I encountered the same problem when I visited the link. Definitely interested in purchasing a copy. It's probably best if you email the press for details - contact details are at the foot of the website's page.